One of the highlights of the summer is being part of a project with a math team at an independent school. We are focusing on collaboration and open dialogue in instruction to support student learning. The project is structured so that there are daily opportunities to experiment with lesson design and pedagogy. The first day I was on campus, the head teacher and I spent time in each of the math classrooms. We were interested in learning what instructional practices and teacher moves are used during mathematics instruction, and the connection of these elements to the work students were doing and the mathematical ideas they were investigating. In one class we visited that morning, the day’s learning opened with a question from estimation180.com. The students were asked to determine Mr. Kraft’s height. As we listened in on the conversation we noticed the students’ guesses about Mr. Kraft’s height were very random. The explanations contained little comparative thinking or relational thinking. This notice was a priority in our team planning conversation. During our planning conversation, we determined the students were more confident with estimating quantities of objects rather than the measurement situation they were asked to investigate using a photograph from the website. They are working on how to use given information to create reasonable estimates and are building deeper understanding of magnitude. So, here’s our plan for Monday. 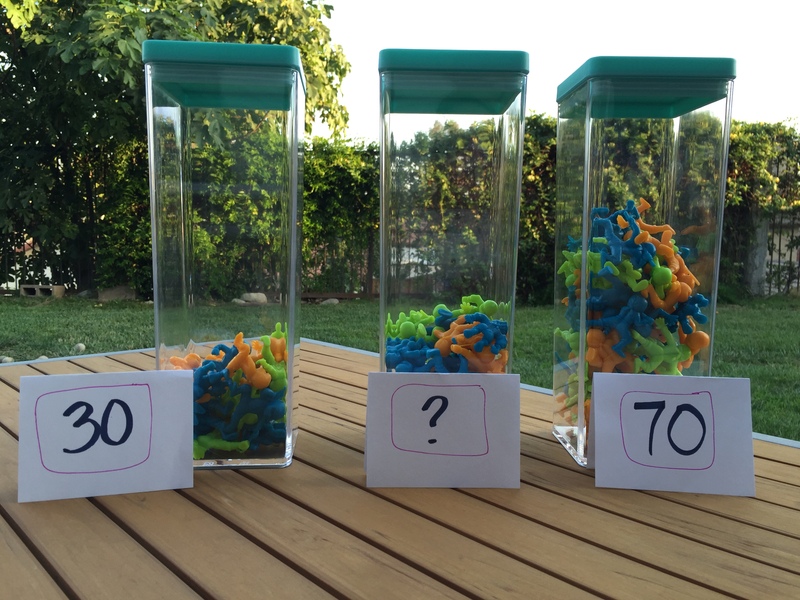 PART 1: Estimation–how many plastic ninjas are in the middle container? The three containers shown in the photo will be on the front table. Students will estimate how many plastic ninjas are in the middle container. They will record the information about the containers and their estimate in a specific way. The number of plastic ninjas in container 1 and container 3 are written in the boxes. The estimate of the number of plastic ninjas goes on the number line. The students will then discuss the information they used to create their estimates. PART 2: Estimation--how many cheese balls are in the middle container? The second round of estimation uses cheese balls from the mega-size container of cheese balls from Target. There will be 10 cheese balls in container #1 and 75 cheese balls in container #3. Students will estimate how many cheese balls are in container #2. They will record the information about the containers and their estimates in the same way they did for the plastic ninjas. The number of cheese balls in container 1 and container 3 are written in the boxes. The estimate of the number of cheese balls in container 2 goes on the number line. A class discussion on the information used to create the estimate will wrap up this part of the day’s work. Part 3: We’ll play an adaptation of a game from Box Cars and One-eyed Jacks called What fits between? In this game, students work in groups of three. Each player takes two cards from the stack of UNO cards (only contains cards 1 -9), placed face down, and creates a two-digit number. When all three players in the group have created their two-digit numbers, they each lay down their cards and read their number. As a group, they decide who has created the largest number and who has the smallest number. The player who has created the number that fits between the largest and the smallest numbers earns the point for that round. The player who has the most points at the end of the work time, wins the game. We will end this part of class with a conversation about how they decided to create the numbers in each round, and what they noticed about the game. Final Thoughts: We are exploring how the use of a specific structure in the lesson supports students as they build a more comprehensive sense of number. Offering the “too low” and “too high” in an estimation task is intended to provide some reference points for the students to use as they create an estimate. The plan is to use this structure and its variations, and then gradually remove the two estimates. Our goal is to ensure that students can construct a sense of the quantity that is represented by the written form of a number and to use this sense of quantity in other situations. We liken it to what happens when we read a word and we create an image. We want that to happen for our students when they are working with number. I can’t wait for school to start this morning. Another well thought out series of tasks. Love the number line reference for the estimations. Hope it goes well.